No man walks alone is a men’s fashion e-commerce store. They travel the world looking for great artisans and designers, often heirs of several generations who have mastered their craft and handpick the products which best fits their customers. The team of No Man Walks Alone saw a unique opportunity in men’s luxury fashion store. Many men would not buy products which are not inspiring and doesn’t reflect their personality. Instead, they will look for an original design with quality and craftsmanship. So the team of No Man Walks Alone grabbed this opportunity and decided to create a men’s fashion store where all the items are handpicked and reflect the quality and craftsmanship of various artisans. Sunflower Lab was contacted by New York based company named BlueSwitch to help them create the Magento eCommerce store. Sunflower Lab’s team worked with the BlueSwitch team to design, develop and bring their ideas to life. A maker’s profile should instantly connect customers with their maker and help them relate to the brand easily. 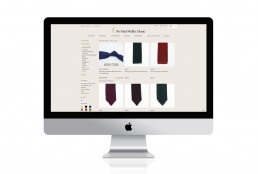 Easy navigation and filters within the products are key points of the store’s success. Size and fit chart by makers is one the custom plug-in that we created during the project. Customers can associate themselves with the brand they are wearing by uploading their pictures to maker’s website. The store also provides various custom filters that you won’t find in any other ready made Magento store.